So what better accompaniment for roast lamb and baby goat than good quality pinot noir made by our cuzzy bros from across the dutch (or "ditch" Australian speak). 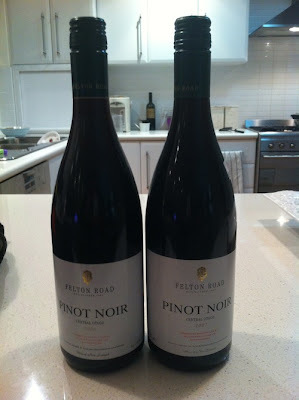 I had recently discovered a couple of bottles of Felton Road (2006 and 2007 vintages) which I had totally forgotten about (which was why they hadn't been drunk! ), and knowing that Amanda loves pinot (okay so she had to tell me), I decided to bring them over. So you think it couldn't get any better for us pinot-philes? Well, the other dinner guests Wayne (not to be confused with Wayne the host) and Wendy also brought a Felton Road, this one being from the 2009 vintage! Such was the anticipation for the Felton Road to pass our lips that we all but ignored Wayne's bottle of 1998 Cape Mentelle Cabernet Sauvignon (I think it was ... I didn't actually pay much attention, although in my defence I dutifully downed 2 small glasses of it, and it was pretty good). When we drank the 2006 Felton Road Pinot Noir, both Wayne (the guest) and I almost simultaneously exclaimed at what a refined, well made wine it was. It had that trademark pinot aroma that made you feel like you were sitting in a soft, warm comfy couch, with subtle plummy and dark cherry fruit flavours and a silky soft texture that slipped down your throat far too easily, leaving us reaching for the bottle to pour again. But it was the 2007 Felton Road Pinot Noir that stood out, making all of us go wow! Amanda in particular had her first taste and immediately exclaimed that it was clearly better than the 2006 (which was damn good on its own, I might add). And she was right. Much more lively fruit on the attack with an almost effervescent mouthfeel. If the 2006 was smooth and silky, the 2007 was like water to a parched throat in a desert. Unbelievable. The 2009 was also bloody good, with more of the effervescent, spritzy mouthfeel, but was a bit too brash, with more pronounced hints of leathery, earthy aromas and flavours. You could certainly see that with a couple more years in the bottle, it could well turn out like the 2007. 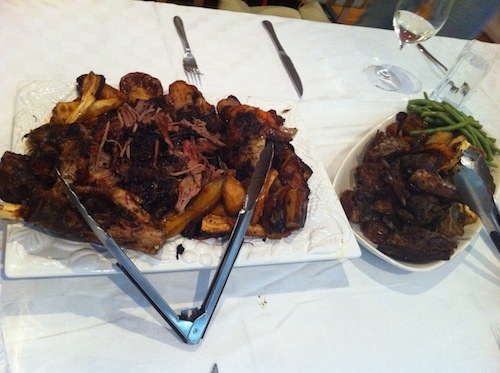 Of course, there's the food too - the goat was cooked in a tray of its own juices, and was just fantastic. The lamb's leg too was perfect - fully cooked through and just falling apart and very moist. I must confess that I ate too much - as if drinking too much pinot wasn't bad enough. But then again, there's no such thing as drinking too much good pinot.